A favorite reliable small tree for the Hudson Valley. 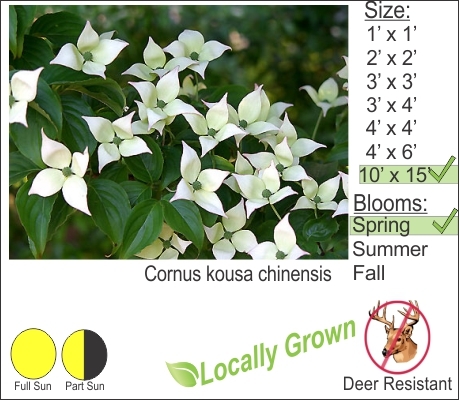 Kusa Dogwood grows well in our region. Beautiful snow white spring flowers come out in May. This small growing tree can be planted near your home. Take care not to plant directly in front of your window unless you intend to enjoy the spring show of flowers. You can allow the tree to grow stems from the ground up or simply prune the trunk to achieve the desired canopy height. After the tree is finished flowering it produces edible fruit later in the season. If you beat the birds and squirrels to it you can make wine out of the fruit. When Autumn rolls around this tree gives you a second show of blazing oranges and reds.